If you know how to setup AnonyTun VPN app, you will definitely find it easy applying any settings on Combo VPN because they share similar UI. 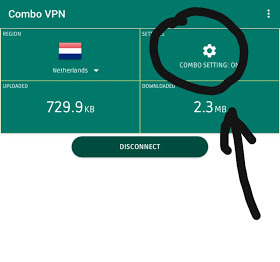 MTN Combo VPN cheat presents you with another option to get free browsing cheat on your Android phone this year although it’s capped at 50MB to 100MB per day but I’m working on ways to make the cheat unlimited so that you will enjoy it to the fullest. For now, you have to manage the daily 50mb to 100mb limit on combo VPN. But before any other thing, you must meet the requirements below for a perfect connection. Launch the app and tap on “Combo Settings” and configure this way. Save all settings and tap on CONNECT. The app will connect after few seconds. Now, minimize and open any app of your choice because it powers all apps. This means, you can use Facebook, WhatsApp, email, web browsers, YouTube and any other app on your phone with the free internet from combo VPN. It’s that simple and amazing. You shouldn’t have any data or Airtime on your phone when testing this cheat else it will be zapped. Therefore I advise you to only use this cheat on an MTN SIM without any credit or data inside. The cheat is capped at 50mb daily for some SIM cards and 100mb daily for some SIM but it renews on daily basis. For instance, if you use up your free 50mb today, you have to wait for tomorrow to get another free 50mb. Meanwhile, anytime yours stop browsing or working, just open the Combo app again and change URL/host to smartapp.mtnnigeria.net:8080 and it will start working again. For those on mpulse Tariff, with data inside, simply open the Combo app again and change the URL/host to mtn.pass.ng to continue browsing. I hope you enjoyed this post on MTN free browsing trick with Combo VPN.